Conroy, Robert. 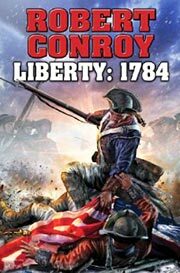 Liberty: 1784, The Second War for Independence . Baen 2014. What if: The British navy defeated the French at the Battle of the Chesapeake, causing Yorktown to turn out as a disaster for the Continental army. Published: Baen 2014 (1476736278BUY), 2015 (1476780730BUY).